ipod sleeping bag! | Keeps Me Out Of Mischief! I’m a handbag person – I used to believe that you could never have enough bags; but as I get older I just want Radley bags. I’m slightly obsessed – each one tells a story, the beautiful green one I received from my parents for my 30th birthday, I bought the brown and pink work bag when I got a promotion at work and the red one one when I finished a module of my Masters course. I treasure each and every one. When I got the first one I was really scared of using it; I wanted to keep it in pristine condition, but I realised that I got far more pleasure from using them rather than leaving them in their protective dust-bag in the wardrobe. One thing they all have in common is that they are constantly full of rubbish treasured possessions… I can never find anything in there. Everything in there is essential; though I could probably survive if I just had my purse, phone and keys… but you can guarantee that I would need something if I didn’t have it in there! My phone is constantly left unanswered and I’m forever getting frustrated because my headphones and ipod are no longer friends in my bag or my headphones are found in a big tangled mess! 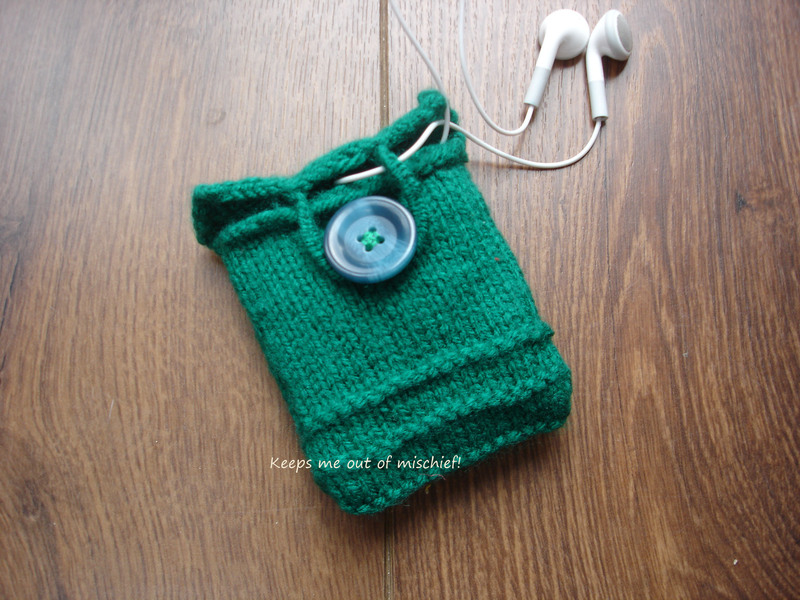 One of the first knitting projects I did as part of my New Year’s Resolution was to knit myself an ipod case which my nephew renamed as an ipod sleeping bag! It’s a really easy project to do and perfect for kids to have a go at as there’s only so many scarves you can make in one lifetime! With kids you could just cast on 18 stitches and do 70 rows of stocking stitch to keep it simple and make it even easier. The pattern below just makes it a bit more interesting. You could of course vary it by introducing other colours – it would be a great way to use up wool from your stash. These instructions make a case for a 3rd generation ipod nano but they can be easily adapted for any size by just measuring your ipod. Fold the cover so that the ridges at rows 23 and 39 line up at the edge and sew up both sides using mattress stitch. There will be flap left over at the top. Form a buttonhole using this technique and sew a button in the correct place – I used a large button as I can’t be bothered with fiddling about with little buttons!